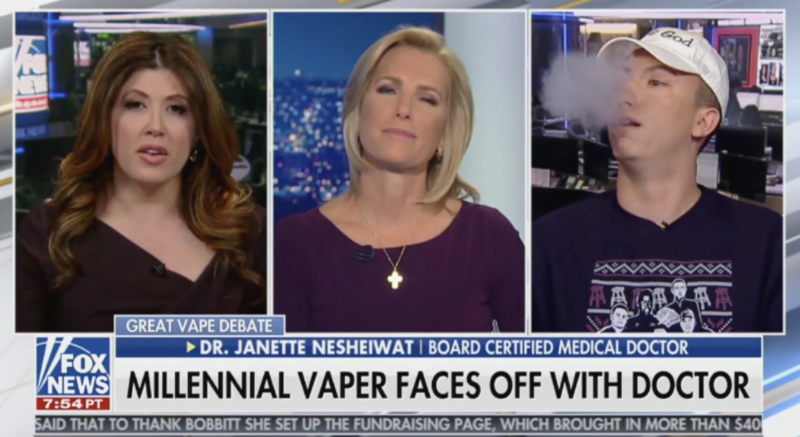 A 22 year old smoked his Juul during a debate with a medical doctor on the potential health risks of vaping Thursday night on Fox News’ The Ingraham Angle. Tommy Scibelli, a regular vape user, was debating Dr. Janette Nesheiwat. “Well look, I’m 22 years old. So I’m using them legally and honestly they’re just cool. You rip them. There is nothing cooler than blowing a fat cloud like that. They call me the colossus of cloud. It helps my swag. It helps my drip. I love walking around. It’s really good for getting chicks too. Honestly I started about a year ago and I haven’t looked back since,” Scibelli began. “Well it’s just as harmful as cigarettes. Smoking causes more deaths than alcohol, drugs, guns, and car accidents combined. The nicotine in cigarettes and in vaping products such as Juul, is highly addictive. And when it comes to children it can cause brain developmental abnormalities in kids. Concentration problems, memory problems, problems with decision-making, anxiety, depression,” said Nesheiwat.